A puzzle game in 10 lines of BASIC. Find two matching blocks that you can reach with your arrows and attempt to delete all blocks on the playing field. The game has three game modes, from easy to hard, providing a challenge to everyone. The eleventh entry in the Tenliner Challenge is the game Ball Bouncer, for MSX1 and higher. The aim of the game is to bounce the ball in some crazy levels filled with trampolines to collect the key in each level. You can move the ball with the left and right cursor keys. Bat Up! is entry 19 and also the final entry in the Tenliner Challenge. Bay Up! is a game for MSX1 or higher where you are a bat stuck in a tower that's on fire, and your goal is to escape the tower by going as high as possible. That there's no end to the tower is not gonna stop you, right? Bubble Dream is entry #16 in the MRC Tenliner Challenge. It's a Super Pang like game in ten lines of MSX-BASIC. The game runs on MSX2 or higher, for the best experience X-BASIC (included in the download) or an MSX turbo R is recommended. 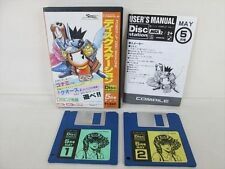 The download features both a ROM and a disk image. Entry thirteen in the MRC Tenliner Challenge is the game Endless Fall for MSX1 or higher. In this game you control a falling man, you have to guide him safely through the holes in the platforms and prevent him from crashing. Entry 5 for the MRC Tenliner Challenge is OldBitsRulez's Fog Hunter. It will run on every MSX, but a turbo R is prefered. Gokivader is an MSX port of the PC-6001 action game, made by Tenliner jury member fukenko. Use the F1-F5 keus to smash the Gokivaders that are invading planet R800. Gokivader is only submitted for fun and as a reference and doesn't participate in the challenge. The download contains Gokivader in .BAS, .TXT and .DSK format and also comes with an extensive README in English and Japanese. Entry #10 in the Tenliner challenge is a basic program that generates Julia Fractals. Different parameters can be set to influence the outcome of the generated image. For MSX2 or higher. Save generated images with the TAB key. More commands are in the help file that's included with the download. The seventh entry in the Tenliner Challenge is Lifeguard, a game for MSX2 or higher. You are a life guard with a water scooter and a mission to rescue all drowning tourists. The zip contains a disk image with a convenient autoexec.bas and a text file with more details. London Rain Matrix is a game for all MSX computers and is entry 12 in the Tenliner Challenge. You have to dodge the raindrops falling down the matrix for as long as possible to receive the maximum score. When you are hit by a raindrop you die, and of course to make it more challenging the raindrops will fall faster as the game progresses.